It’s easy for stand-ups, which are supposed to be brief team-sharing ceremonies, to turn into extended meetings. Limit the conversation to simple statements about things the entire team should know — what you did yesterday, what you’re doing today, and any blockers or help needed. 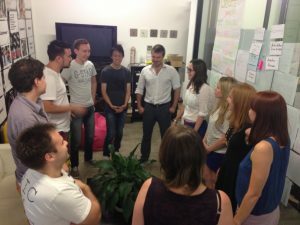 … Stand-ups are not venues for technical discussions, making decisions, proposing designs, swapping war stories, reorganizing a sprint, or doing anything other than communicating what’s necessary for group coordination. … Anything that comes up outside of the mutual status update should be deferred to a huddle or email. A stand-up should take no more than 15 to 30 seconds per team member. 15 signs you’re doing agile wrong, Steven A. Lowe, InfoWorld, May 26, 2016. It was a major faux pas in a meeting with many VPs and C-level managers. I said that it was taking us about one minute to review each defect at our daily status meeting. That, it appears, was unacceptable. Too simple. It implied that we weren’t taking enough time to truly hash out the issues on each defect. The fact that we got hundreds of defects reported each week and would finish the product by disposing of defects totaling in the tens of thousands was besides the case. For more on the desire for complexity see Is Your Project Management On Steroids? Maybe You Should Kick The Habit! This organization was also not successful at delivering products on time, let alone with good quality. It was never a question of if we would deliver on time but instead it was how late would we be. It was clear to me, based on direct observation and upon past experience, that excessive meetings and meetings that go on forever are almost always an indicator of bad management practices. Most often it is a combination of bad plans (e.g., not realistic, compressed, etc.) combined with a culture of a reluctance to share information (hiding bad news, power and control, etc.). I had gotten the teams to simply give their defect status by telling everyone if the defect was a new one or not or if they had a root cause for the issue or if they had found and tested a fix yet. Once they gave this information they could move to their next open defect or the next team manager would have the floor to cover their open defects. We would get quick comments such as “we can help with that” or “I can reproduce it” and otherwise we ensured that everyone who needed to know about the defect knew who was working on it. It was quick, simple and effective, but more senior management found it suspiciously unsatisfying as it was done in 60 seconds. For more details see Meeting Madness, Don’t Do It! Whether 30 years ago in a government waterfall planned project or today in a start-up’s daily stand-up, meetings that go on forever are an indication that we have a problem — not ordinarily with the product — but inevitably with how we are managing. If we find ourselves needing more and more meetings then we need to look for the root cause and realize that more meetings are a symptom of deeper issues and are rarely the solution. Are your meetings helping or hindering your project management?